Processors allow you to process areas defined in the sources view. 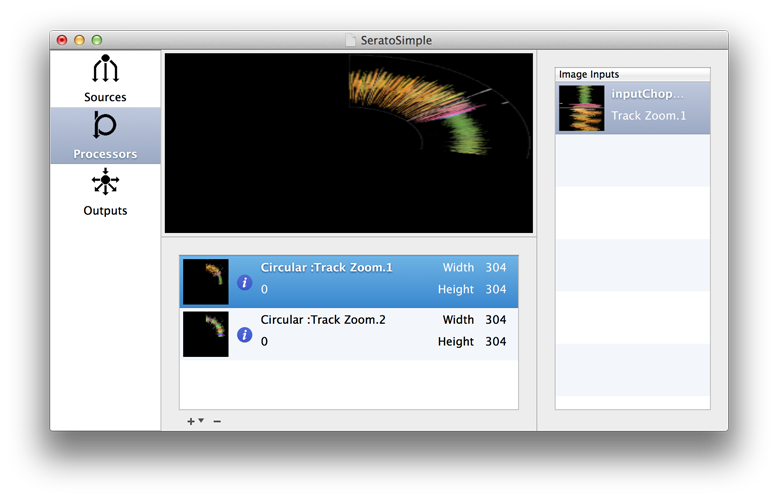 Effects can be applied, and custom effects can be provided using Quartz Composer files. Processors are listed in the centre table, the areas being used for the currently selected processor are shown on the table on the right, with options presented in the box below. To add or remove Processors, use the “+” and “-” buttons on the bottom of the table. Currently two types of processors are available. Quartz compositions can be added to generate their own content, or to provide custom image processing. Published image inputs in Quartz Compositions are detected and made available in the top right image inputs table. Inputs can be changed by double clicking the input and selecting the area to use as an input. The 2 channel mixer allows you to mix two source inputs into a single image for display.